Meet Milan, a young disabled supermodel from New York’s Upper Eastside who falls deeply in love as she is coming of age. In this romantic drama the emotional conflict of a girl’s inner soul is revealed as she deals with first love, the pain of a loss, the pleasures of stardom while coping with a lifelong disability. In the world of Milan the people are real, the situations are rolling, and the truth is often concealed. 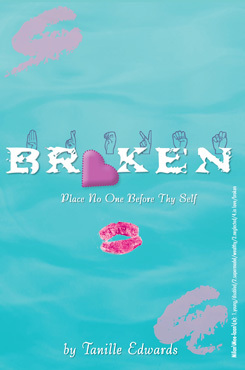 Broken is a racy circle of sisterhood, laced with a touch of earthiness, glamour, wealth and fame. New Tanille Pop R & B Album Included! Milan's in a very unique position. She's a teenage supermodel hiding the fact that she's hearing impaired. While her family and a few close friends know the truth, the public does not. Milan knows what it's like to be discriminated against and teased, and she's reluctant to become the poster child for disabilities at the height of her fame. Adding to this is the grief she feels about her mother's death, her distant father, and a brother who despises her for reasons that are never quite clear. There are also boys -- a longtime love interest, and a foreign exchange student who swoops into her life in a very big way. Milan's not alone, though. She has a large group of friends, girls who are colorful, outspoken, and (most of the time) supportive. Their world is that of the rich and privileged, with fashion galore, lavish parties, and photo shoots with the sprinkling of the more mundane -- namely high school. Because even though they're fabulous, they still need to graduate! The novel ends on a cliff-hanger. We're not quite sure how Milan will handle this latest curveball thrown her way. I do wish that there was more about Milan dealing with her disability. She's trained herself to sound "normal" when speaking, but I wanted to feel more of her struggle. It seemed like this was something she would have to deal with on a daily basis, especially when dealing with new photographers on shoots, or even in high school, but most of the time, I forgot that she was hearing impaired. Who do I recommend this book to? Anyone who loves to read about the glamorous jet set and young love!